This post is a continuation of Statistics in the Triad, Part I: Geometric Mean. The two are meant to be read sequentially, since the mathematical elements of the first are an important and inescapable prerequisite for the second. If you already have a working knowledge of the geometric mean, however, and how its use differs from that of the ubiquitous arithmetic mean, then you can just read on. 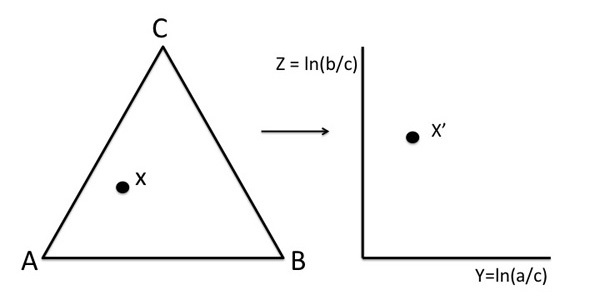 The fundamental property of a triad or ternary plot that requires special consideration when applying statistics is its constant-sum or closure constraint. In a SenseMaker project, the data automatically sum to 100% when a respondent clicks or places a marker inside the triad on a collector screen; or the results are normalized (see Part I) if the respondent otherwise enters numerical values for each of the three components (vertices), which are then divided by the sum of the three values to yield percentages. This results in a loss of one degree of freedom, which means that if one of the variables is changed, the combination of the other two must necessarily change as well, but in the opposite direction. Thus, spurious negative correlations can arise among the data that fall completely outside any interpretive, subject-matter context, such as a SenseMaker project. This problem has been recognized for more than a century (Pearson, 1897), though it did not gain widespread notice until geologists began looking for workarounds in the 1960s and 1970s, prompted by a paper by Chayes (1960). In addition, because the bounded compositional data (in the range 0 to 1) of a triad cannot have a normal distribution, any statistical method that assumes non-bounded data (typically -∞ to +∞) cannot be used, for example, factor and principal component analysis. Even the lowly arithmetic mean is suspect. A “practical tool of analysis” came in the 1980s in a series of papers by the statistician John Aitchison, fully articulated in his 1986 book (p. 112, reprinted in 2003 with some supplementary materials): The Statistical Analysis of Compositional Data. In the subsequent three decades, there has been considerable work on clarifying and extending the theoretical underpinnings of Aitchison’s work, in particular by Vera Pawlowsky-Glahn, Juan-José Egozcue, and their collaborators. The most succinct summary of these results can be found in their 2006 paper (see References); and a more extended treatment is given in their 2015 book, Modeling and Analysis of Compositional Data. Several others among the Additional Readings are less accessible and not for the mathematically-faint-of-heart. data points that may be available for that triad. At a stroke, this creates two independent variables and moves the data from the closed ternary space (the “simplex”) to the domain of real numbers (-∞ to +∞), thereby eliminating spurious negative correlations and other covariance problems and opening up the transformed data to a variety of standard statistical methods. Equally important, there is an inverse transformation that allows results to be brought back to the triad for display with the original data. The arithmetic mean calculated from (3) for the transformed data is shown as the red dot in the right-hand graph above. Not surprisingly, it falls “midway” along the distribution. The red dot is also shown in the triad. We’ll look now at how that return step, the inverse transformation, was done and the significance of the resulting point. coordinates in the triad — also the red dot. Surprising, confusing, unsettling… but true! As Aitchison (1989, p. 789) says, this is precisely “the composition formed from [the] geometric means by the process of closure” (Aitchison, 1989, p. 789). In other words, the arithmetic mean in the log-ratio plot is identical to the geometric mean in a triad. Although the distinction between the arithmetic and geometric means is enhanced visually when the data are in a well-defined, curved array like this, the general principle remains: the geometric mean is the appropriate “measure of location” for constant-sum data. What if the data are just an amorphous blob? It doesn’t matter — use the geometric mean! 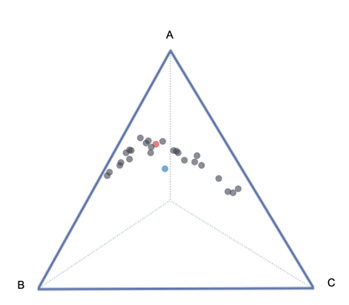 OK, but what if the data look more like a typical SenseMaker study, with respondents’ dots located near the center, near the three vertices, and along the three bisectors? It doesn’t matter — use the geometric mean, whether for the entire data set or for cohort- or signifier-defined subsets. There is one situation, however, where careful inspection of and experimentation with data patterns might be particularly helpful. Some of the curved arrays encountered in geochemical studies of volcanic rocks have a temperature-dependence, displaying changing composition as lavas and magmas cool and crystallize. Under the broad rubric of thermodynamics, “cooling” means “passing time.” So moving “down” such a data array would, in general, be tracking time. That thought evokes SenseMaker projects employing either punctuated or continuous capture of data, where a fixed group of prompts and signifiers is used over an extended period of time. In that situation, especially if various interventions occurred in the hope of eliciting a change in behavior/response, then tracking time would be both necessary and valuable. A study that was well-designed in this regard might be the perfect way to persuade a skeptic — for example, a client who didn’t fully appreciate the wonders of the math — that the geometric mean is the right “measure of location” to use. And once demonstrated to the skeptic’s satisfaction, the point would carry over to any distinctions among data, whether temporal or demographic or cultural. Aitchison, J. (1989) Measures of Location of Compositional Data Sets. Mathematical Geology, v. 21, p. 787-790. Pawlowsky-Glahn, V., and Egozcue, J.J. (2006) Compositional data and their analysis: an introduction. in Buccianti, A., Mateu-Figueras, G., and Pawlowsky-Glahn, V., editors, Compositional Data Analysis in the Geosciences: From Theory to Practice, Geological Society of London, Special Publications 264, p. 1-10. Pearson, K. (1897) Mathematical contributions to the theory of evolution. On a form of spurious correlation which may arise when indices are used in the measurement of organs. Proceedings of the Royal Society of London, v. 60, p. 489-502. Egozcue, J.J., and Pawlowsky-Glahn, V. (2005) Groups of parts and their balances in compositional data analysis. Mathematical Geology, v. 37, p. 795-828. Egozcue, J.J., and Pawlowsky-Glahn, V. (2006) Simplicial geometry for compositional data. in Buccianti, A., Mateu-Figueras, G., and Pawlowsky-Glahn, V., editors, Compositional Data Analysis in the Geosciences: From Theory to Practice, Geological Society of London, Special Publications 264, p. 145-159. Pawlowsky-Glahn, V., Egozcue, J.J., and Tolosana-Delgado, R. (2015) Modeling and Analysis of Compositional Data. John Wiley & Sons, New York. 272 pp. van den Boogaart, K.G., and Tolosana-Delgado, R. (2013) Analyzing Compositional Data with R. Springer-Verlag, Berlin. 258 pp. von Eynatten, H., Pawlowsky-Glahn, V., and Egozcue, J.J. (2002) Understanding perturbation on the simplex: a simple method to better visualise and interpret compositional data in ternary diagrams. Mathematical Geology, v. 34, p. 249-257.